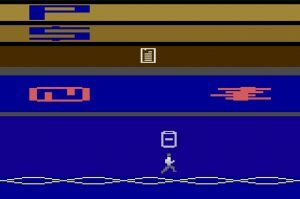 Gene Medic is a retro edutainment game developed for the Atari 2600 Video Computer System (VCS). The goal of the game is to cure a patient of a common disease by editing harmful mutations in their DNA while not exceeding the budget afforded by the patient and their health insurance. While some mutations are known to be harmful or helpful others are unknown until the medical literature is consulted or the appropriate biological context is identified in the patient’s electronic health record (EHR). Health insurance, medical literature, and EHR powerups will help the player save the patient during the game. The game is easy to learn and freely available for play on modern computers using emulators such as Stella. The source code is available for those interested in programming for the Atari 2600 in 6502 assembly language.